I LOVE the Kills, so when they played onThursday 26th in Auckland at the TransmissionRoom and I had the opportunity of meeting them through a friend I had to show my appreciation. 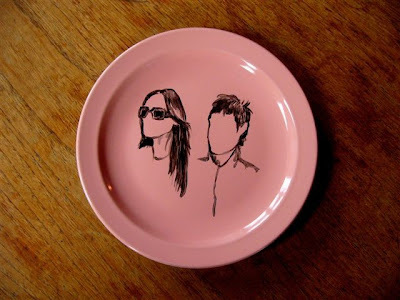 This portrait plate was on my Etsy shop but I knew it had to be with it's rightful owners. To my delight both Alison and Jamie loved it so much they planted kisses on both my cheeks and declared no-one had ever given them a gift as fab as that. Jamie also commented that I made his skin look great awww so sweet. They took the stage 15 min later and rocked us with their unique style of garage blues. The hits Black Balloon and The Last Day of Magic were the crowd pleasers but their encore version of I Put a Spell on You really gave me goosebumps.